The 38th edition of the Blue Dragon Film Awards took place on a rainy Saturday evening on November 25th in Seoul with a slew of stars and directors in attendance. This year’s chart-topping hit A Taxi Driver was triumphant during the show, as it picked up four prizes, the most of the night. 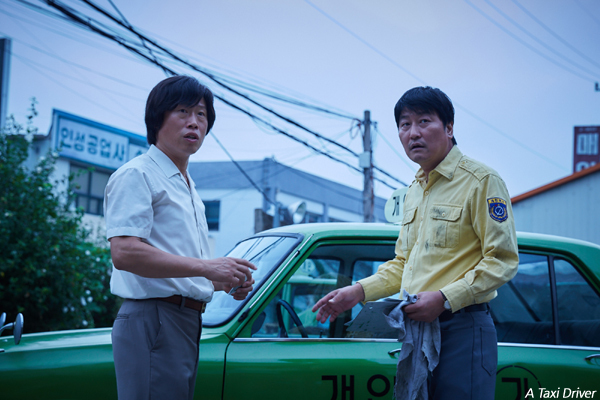 From director JANG Hun, Gwangju Democratization Movement drama A Taxi Driver won the awards for Best Film, Best Actor (SONG Kang-ho), Best Music (CHO Young-wuk) and the Audience Award for Most Popular Film, which it earned for being the year's most well-attended release with over 12 million admissions. SONG’s win for Best Actor was his second from nine nominations, after winning for 2013’s The Attorney. Not far behind with three awards apiece were the human drama I Can Speak and the prosecutor saga The King. I Can Speak claimed the Best Director award for KIM Hyun-suk as well as Best Actress for NA Moon-hee, who previously won the Best Supporting Actress Award for Cruel Winter Blues in 2007. NA also earned one of the night’s four Popular Star Awards, the other recipients being SUL Kyung-gu for The Merciless, KIM Su-an for The Battleship Island and ZO In-sung for The King. HAN Jae-rim’s The King also won awards for Best Supporting Actress (KIM So-jin) and Best Editing (SHIN Min-kyung). LEE Hyun-ju took the Best New Director prize for her debut Our Love Story, CHOI Hee-seo earned the Best New Actress accolade for Anarchist from Colony and DOH Kyung-soo was crowned Best New Actor for his role in MY ANNOYING BROTHER. KWAK Eun-mi won Best Short Film for A Hand-written Poster, which also won the Sonje Award for Best Short at the Busan International Film Festival in October. Elsewhere, JIN Seon-kyu won Best Supporting Actor for THE OUTLAWS, HWANG Dong-hyuk picked up Best Screenplay for The Fortress, The Merciless won Best Cinematography (JO Hyung-rae) and Lighting (PARK Jung-woo), Best Art Direction went to The Battleship Island (LEE Hoo-kyoung) and the Best Technical Award went to KWON Ki-deok’s stunt work on The Villainess.